TERA PC - General Discussion: Summer event in Eu. So these are contents of balder medalions in europe. Why does eu tera get all the good stuff lately and we get crap. Are we not allowed to criticize eme for stupid decisions now? Why would I leave a 6 year account to play in a laggier region. Mostly this is a good argument for only running the event for 16 days as opposed to over a month. With the token prices the way they are, the selection, and time limit, people will have to grind and still pick/choose what they want (if they want the premium items), but it avoids the problem of RNG that mostly frustrates. Seriously, I would grind my [filtered] off farming for that since it's guaranteed instead of dealing with RNG [filtered]. But the prices are more tasteful to the players. Look at everything they are getting. The rewards are clearly a lot better and players can choose any of those good rewards. Us? we get the boot, and get overpriced boxes, which we still have to deal with rng even after the time it takes to farm a single box. But hey, look at this, you can pay us money to buy LOOT BOXES that yield the same results as the overpriced in game boxes. And it was "fun" in a "wow gee I'm getting a lot of costumes and accessories I can use for not much effort" kind of way. And some were pretty good costumes to have. This directly leads into broker shenanigans so I don't think I need to explain further. So yes, it was fun (unless you're a broker hoarder, perhaps) even if it was way too generous. u say that but if pushed far enough that's exactly what people will do, and then you'll end up with the situation we had several years ago where gameforge tera was DEAD and the economy was so broken that vital things like ses scrolls were selling for 20k gold with only 2 on the broker except this time around it'll be on NA tera. and given the age of the game now i could see BHS just closing up shop entirely if NA servers get that bad instead of trying to fix the problem. I wasn't saying otherwise. The point was just that, by making the event shorter/more concentrated, they don't have to worry so much about "oh no, people will be able to farm this excessively on all their alts for 5 weeks straight", and by having so many variety of choice and still requiring the grind to get good things, it means people won't load up mountains of costumes like happened here last year. You have to prioritize how you spend your tokens. In the end, I do think it's a better way of handling an event like this on the whole (but I'm sure they also partly had the benefit of seeing the reception to the event here to influence their choices; I'll be interested to see what EME does on console). That's what counterpoint is saying. The player gets to set a goal and grab exactly what he/she wants, and the brokers don't have to worry too much about 10 million versions of the same item interfering with their own sales. Quality > quantity and all. Don't forget: the cash shop boxes remove a layer of RNG that's present in the in-game event boxes. "Want a smartbox instead of a random item that may not be for any of your characters? That'll cost ya!" Agreed, but the only consolation is that this year it's still not worth it to buy on the daily deals because of how cheap it is on the broker (from last year's over-supply). So basically this year is 100% a reaction to last year, since the value of all swimsuits completely tanked. Hopefully next year we can start with a fresh slate. Ok I left EU because back then it was soo crap I didnt get anywhere at all. But now the tables have turned. Ill check EU again maybe they change and improved. It's funny, people said the opposite like 3 years ago. Times have changed! I'm too tired to give constructive criticism, they never listen to it. They're just pathetic. Why care about last year's event and "balancing out" in favor of players fun, enjoyment and incentive to do the event. That's disgusting. This is not real life, it's a [filtered] videogame that people play in their spare time to have fun. I don't want to wait for a [filtered] year to have a fun even because last year's was way too fun. What [filtered] reasoning is that. They're willing to sacrifice their playerbase by c ucking us out of so many things I find it incredibly amusing and incredibly sad at the same time. Eme should set some priorities straight or this game won't last for long. Listening =/= Do what you want they do. Thank god you pointed that out, I wouldn't know otherwise. Come on Usagi people have been complaining for months now and EME didn't listen to a single thing. Last time eme genuinely listened to the players was like... When elite crystalbinds became a thing? And afaik that's when spacecats was still here. I don't want eme to cater to my every wish, I want eme to get their [filtered] back together. They shouldn't need players to tell them that honestly. Come on, I agree that the event it self is not that good, they screwed with the rng from the lootboxes you buy with medallions. I have to say I really like the concept of token shops that EME used with spacecats as a cm and i still think that the best way to get rewars from events is from something similar that let you work at your own pace to get the prize you want from a wide variety of cosmetics or consumables, even if the price was high. However I am concious that past summer event screwed with cash shop sales because it was way too rewarding and this event is the consecuence of that. Last year summer event many guild mates got few hundred of cosmetics and from other past events same thing, many of them had all their bank tabs and character inventories full with cosmetics from the past 2 year events, do you know what does that means for a game that has a cash shop of the same cosmetics? that means they got screwed. That was something I was pointing out in the past in many threads, it was an error to give away too much with no effort to players, you make then used to op rewards and you get screwed in your sales, they needed almost 2 years to learn from the mistakes of those op events but now they are doing events extremely cautious to not screw the cash shop sales. I can only think that BHS got a long talk with EME crew becuase poor sales on events they maybe expected more income. In the end this is a bussiness and sales is what justify their actions. If sales are better now than last year then they might be doing things the right way for "bussiness", however if sales are not better or worse than last year event then they will take another turn maybe for better. We're talking about the differences in event rewards and general economic structure between a publisher with a fair amount of autonomy, and a publisher that is a direct subsidiary of an Eastern game developer. EME has almost zero freedom to deviate in any way from what Bluehole dictates. En Masse's TERA is basically an English port designed to operate with minimal effort and cost. I realize that this is the ideal scenario for most businesses, but Korea is out of touch with the North American market and they foolishly try to run EME with a "pure profit" mentality. This means that they expect money out of a product they don't put any money into improving. The problem is that it works. People still spend money on this game, which means there's no incentive for BHS to change their practices. A financial boycott of TERA is the only way they'll understand they need to change. On the other hand, the foundation for your complaints is that you're not getting cash shop fashion, which in no way affects gameplay, from the free summer event boxes. Especially you. You keep repeating this, but it doesn't mean anything. Of course the cash shop box will the better option. The items were previously restricted to the cash shop to begin with. How do you think En Masse has kept TERA afloat in the West? Through cosmetics. Cosmetics that do not affect gameplay. They just gave players the opportunity to earn them in-game. That's not even mentioning the other materials and consumables they put in the shop. Cuckold: a man whose wife is unfaithful. It's typically used to refer to men who know their wife is cheating on them, and are either passive or accepting of it. I don't see what EME has to do with potential infidelity. I get wanting to fit in with the cool kids, but regurgitating trendy buzzwords that neither you nor they know the definition of just makes it that much easier to write you off. The more you know. People say its because EU event is shorter they get better rewards but the front page on EU it says " participate in some great summer activities from Thursday, 12th July until Tuesday, 28th August 2018"
The fiction gets a lot more complicated because EME is BHS's brother, and Gameforge pays BHS a percentage of their income as child support. So even if the players here leave and go to Gameforge (increasing their income), BHS (and EME by proxy) still win. Since it's a business arrangement and not a marriage, they won't get jealous. The origin of the word cuckold lies in the nature of the cuckoo bird, which dumps its eggs in a different bird’s nest so the other bird will raise the cuckoo’s chicks for it. While the term certainly has to do with infidelity, its deviation in referring to weak willed individuals who act against their self interests is pretty obvious when we examine the term with its origin in mind, since the victim bird, much like tera's playerbase, is acting against its self interest by sustaining the product in question. When one further examines the [filtered] side of the word, in which one person enjoys being humiliated (I won't elaborate further than this) and repeats the degrading act of being cheated on again and again, then the deviation makes even more sense. Indeed, the phenomenon is not even a recent one. Referring to weak willed individuals as cuckolds and calling people that term as a general insult or just for comedic effect has been practiced for centuries. There are instances in Shakespeare plays where men we're expected to mock are called cuckolds or are told to don a cuckold's "horns" even when their wife's faithfulness is pretty much unknown in the story. If you really want to google this stuff, you can even find ridiculous old paintings of cuckolds wearing their horns and prancing around ridiculously, showing once again that the emphasis lies less with the literal definition and more with a broader sense of what the term represents and the general icky feeling the cuckold evokes in readers. In Rex's post, the word was used to refer to EME taking something away from the players that EU gets to enjoy. It is not hard at all to see the connection to cuckold fetishism, as the [filtered] side of this term derives its "pleasure" from one individual having his wife taken away so that another man can enjoy her. Literally just in here to comment on cuckoldry. The rest of this thread, while interesting, just goes to show you the difference between a publisher with freedom and a publisher with chains. > So these are contents of balder medalions in europe. > > So these are contents of balder medalions in europe. > One word for that.. Thanks for the link. Seriously screw EmE. 1 question are those boxes only temporary or perma? I'm not adding to the conversation with this comment, but I want you guys to know that that all makes way more sense than it should. EME has no idea what they're doing. Having a mount and crafting mats for Stormcry has no effect on their daily deals for swimsuits. This is why people don't spend money on this game. And that beach medalion equivalent outside of plenty smaller little worse skins like shellback, butterfly wings, beach hat also have all daylight accesories and empowered brooch costing 100-120 and 180 for necklaces. 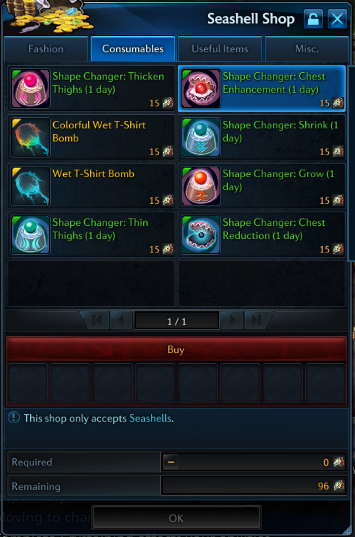 Just like the battleground coins there is nothing I want to buy from these tokens, shape changer chest which is the best item is missing. damn now i know how someone got the elephant mount, at least EU tera still has useful rewards from events i haven't even touched this years summer event on NA tera so not worth it instead i decided to make a character on EU and surprisingly enough the lag is close to non existent :O. i also live in WA USA, seems to point towards their coding and not the game itself to being the issue. EU tera feels like they actually care about their game i haven't felt that way in awhile on NA Tera it's sad . Also the buddy up code rewards z0mg awesome on EU tera! worth sharing those codes all the way. the real problem with NA tera right now is that whoever is in charge seems to have the attitude "they're just a bunch of whiny babies!" i did not play much this whole event but i ended up with more then enough stuff just from the crab spawning and overall they are fun, i think this is one of the more ballanced events they had in the last few years overall, we just got to spoiled befor and now we just want more and more. This is the worst summer event I ever saw. What will you even buy with your sun tokens and seashells?